Reading the newspaper during your morning commute is about to get a lot more convenient. LG recently unveiled its flexible e-paper, a new type of e-reader designed to mimic the look and feel of a newspaper page. Once commercialized, the revolutionary technology will slim down bulky dailies and hopefully save tons of paper, wastewater and carbon emissions. 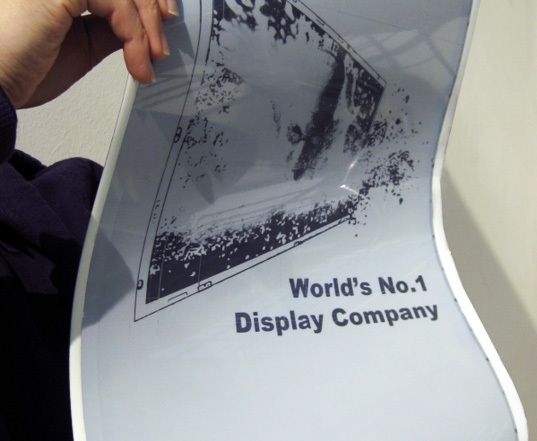 The Korean company’s product features a 19-inch-wide display at a thickness of 0.3 millimeters – about the size of five sheets of paper. Unlike other e-readers currently on the market, the new technology bends and returns to its original shape, giving it the look and feel of a printed page. Designers hope the tech’s flexibility will draw in customers because it mimics a traditional newspaper page but eliminates the need for cutting down trees. To produce the tech’s bendy features, designers arranged the display panel on metal foil instead of a glass substrate. Plus, the gate driver IC exists right on the panel instead of on the side of the panel, providing even greater flexibility. The release of products like the Amazon Kindle and Sony Reader has sparked much debate about the environmental impact of e-readers versus that of traditional printed books. According to a New York Times blog, the book and newspaper industries were responsible for harvesting about 125 million trees in 2008. In addition to publishing’s role in deforestation, paper processing creates significant amounts of wastewater and a huge carbon footprint, so it’s clear that consumers need some kind of eco alternative. We couldn’t find figures on the e-paper’s power consumption, but we’re guessing that so long as it’s sturdy and doesn’t require a ton of power, it may be a better option than traditional printed media. LG’s 19-inch-display reader is just for show, but the company plans to launch an 11.5-inch, flexible e-paper product in the first half of 2010. One thing people dont realize is, that at least the generations to come will consume digital content in screens, no problem. Only the oldies, still like paper. Remember when Xerox announced the end of paper 10 years ago? Using this technology for reading materials that are quickly disposed of, like newspapers, magazines, catalogs, and mass market paperbacks, is a great idea. This seems to have more immediate appeal than e-readers that are meant to replace books, which are made to last more than other publications.